Knowing what extinct animals ate has long been determined by analyzing carbon isotopes locked inside fossil teeth. For two decades, a key isotope value in these equations has been assumed to be the same for all plant-eating mammals, but new research led by Julia Tejada-Lara from the American Museum of Natural History and Columbia University, and published in the journal Proceedings of the Royal Society B, contradicts that assumption, revealing that the value changes with body size. Inferring the diet of extinct vertebrates traditionally depends on anatomical data for a species–for example, the shape of teeth, the height and amount of wear of tooth enamel, and the configuration of the skull and jaw. But more recently, researchers started using stable carbon isotope analyses (δ13C) to directly determine the foods extinct herbivores ate while alive. Stable carbon isotopes, which form in specific proportions inside plants, are preserved in the body tissues of the animals that eat those plants. By taking samples from the animal's bones, teeth, toenails, or other biological material, paleontologists can determine the kinds of plants that individual animals consumed, how different species might have split up resources in the same habitat, and even overall rainfall or other environmental characteristics. "Stable carbon isotope studies now are an essential part of our scientific toolkits, informing a wide array of paleontological and geological topics, from predator-prey interactions to ancient rainfall estimates," said John Flynn, a co-author on the study and the Frick Curator of Fossil Mammals in the Museum's Division of Paleontology. "Applying our new formulas that account for body size effects is essential for a more accurate understanding of the history of diverse species, ecosystems, and climates in Earth history." As an animal incorporates carbon from its diet into its body tissue, an array of physiological processes affects how much of and in what proportions the carbon isotopes actually get absorbed. Based on studies of cows and other large ungulates, scientists have widely assumed that the skeletal tissues of all plant-eating mammals are "enriched" by about 14 per mil (14 parts in a thousand) in stable carbon isotopes relative to the food that they eat. That constant, called the enrichment value, is an essential part of the equation scientists use for geochemical analyses of animal diets. But Tejada-Lara, a graduate student at the Museum and at the Department of Earth and Environmental Sciences at Columbia University, who was studying sloths, was suspicious that something was overlooked with this one-size-fits-all equation. "Using a single value for all mammal herbivores, from tiny monkeys to giant elephants, seemed like a large assumption to me," said Tejada-Lara, the lead author of the study. "I decided to take a closer look at the enrichment value in living and fossil sloths because they are outliers in a number of traits when compared to plant-eating mammals as a whole." In collaboration with the Huachipa Zoo in Lima, Peru, Tejada-Lara sampled the food and tooth dust–collected during routine veterinary dental care–of two species of modern sloths: the three-toed sloth (Bradypus variegatus) and the two-toed sloth (Choloepus hoffmanni). The sloths analyzed were fed a controlled and steady diet from a young age, giving researchers the ability to directly measure the amount of stable carbon isotope they ingest. When the researchers calculated the carbon isotope enrichment value based on samples taken from the sloths' teeth, they determined it to be 10 per mil for three-toed sloths and 12 per mil for two-toed sloths. 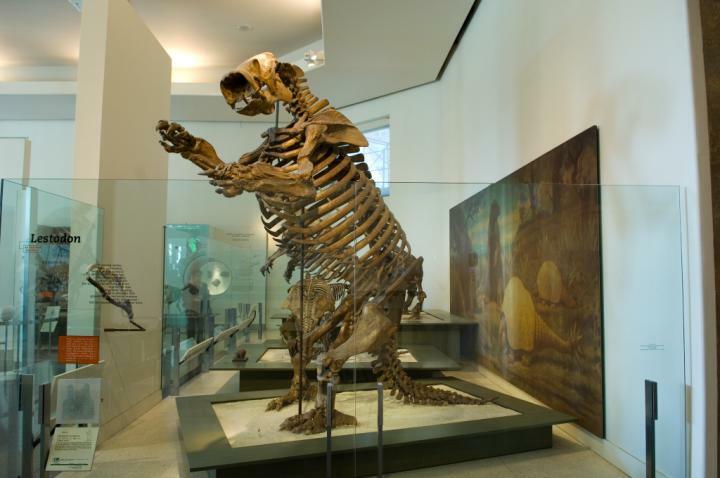 They then measured the enrichment value for the giant extinct ground sloth Mylodon darwinii, which lived in South America until about 10,000 years ago. By sampling the dung recovered with the fossil and the teeth of the specimen, the researchers determined the tooth tissue was enriched by about 15.5 per mil relative to the proportions in the dietary carbon. "That's about a 5-per mil variation just within a single group of mammals," Tejada-Lara said. "That can make a big difference in the interpretation of research results, including the potential of this discovery to provide more precision on how the evolution of the diet in our own lineage has evolved, because primates include small and large species." The researchers combined the sloth data with enrichment values calculated for a range of other mammalian herbivores with known diets, from prairie voles to pigs to giraffes, and found a dramatically clear pattern: the enrichment value generally increases along with body size. They found that at 9.1 per mil, the house mouse (Mus musculus) had the lowest value of those measured, and the extinct sloth Mylodon had the largest value. Based on this study, the research team has proposed new models of how carbon is incorporated into mammalian plant-eaters, from food to teeth, for the scientific field to integrate into their studies of modern and ancient animals and ecosystems. The study also found a different pattern of enrichment depending on the makeup of an animals' digestive tract–specifically whether the animal is a foregut or hindgut fermenter. As it turns out, the giant ground sloth Mylodon was a foregut fermenter producing huge amounts of methane. Other authors on the study include Bruce MacFadden, from the University of Florida; Lizette Bermudez and Gianmarco Rojas from the Huachipa Zoo; and Rodolfo Salas-Gismondi from the Cayetano Heredia University and the San Marcos National University in Peru. Funding was provided by the Florida Museum of Natural History, U.S. National Science Foundation grant# PIRE 0966884, Columbia University's Graduate School of Arts and Sciences, and the American Museum of Natural History's Division of Paleontology Frick Fund.